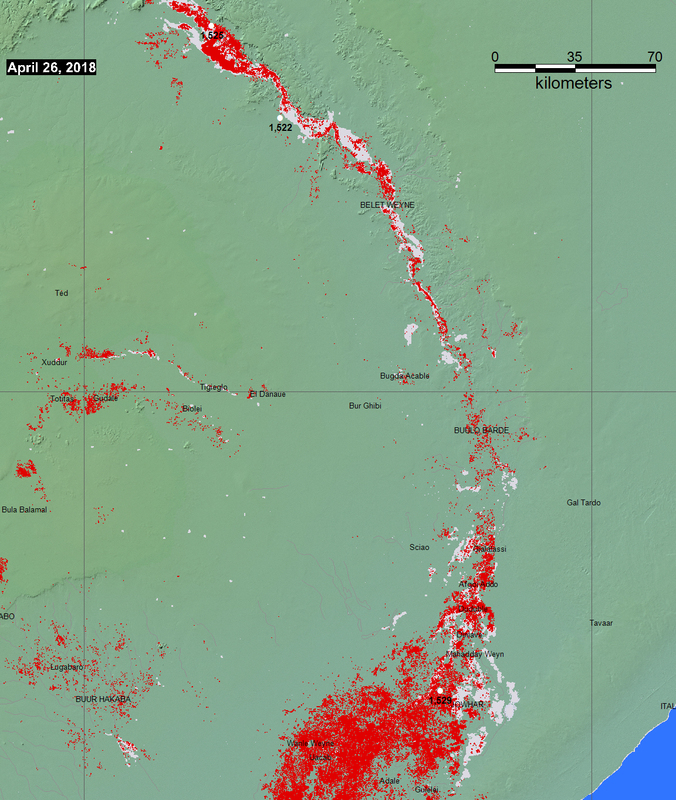 Red is flooding mapped from Copernicus Sentinel 1 data provided by the European Space Agency. Blue is a reference normal water extent. Light gray is all previously mapped flooding, since 1999. At selected locations, a time series of satellite microwave-based daily river discharge measurements are available from the Flood Observatory. See River Watch Global Display for more information, or click on site location markers. A sample from Site 1525 is shown below. According to Flood List: "Somalia – 175,000 Displaced as Flood Situation Worsens 3 MAY, 2018 BY RICHARD DAVIES	IN AFRICA, NEWS · 0 COMMENT The flood situation in Somalia has worsened over the last few days. Observers say the current floods are some of the worst the region has ever seen. The UN says that flash and river floods have now affected 427,000 people in Hirshabelle, South West and Jubaland states as well as Banadir region. Almost 175,000 people have been displaced by the flooding, with most of them in Hiraan province. The UN says that an estimated 122,580 people have been displaced in Belet Weyne (Beledweyne) town and surrounding riverine villages after the Shabelle River burst its banks and inundated houses and crops. Some of the affected were already internally displaced. "Internally displaced people remain the most vulnerable to the impact of the flooding with many camps located in low-lying areas," Stéphane Dujarric, the spokesperson for the UN Secretary-General said, briefing reporters in New York on Monday."